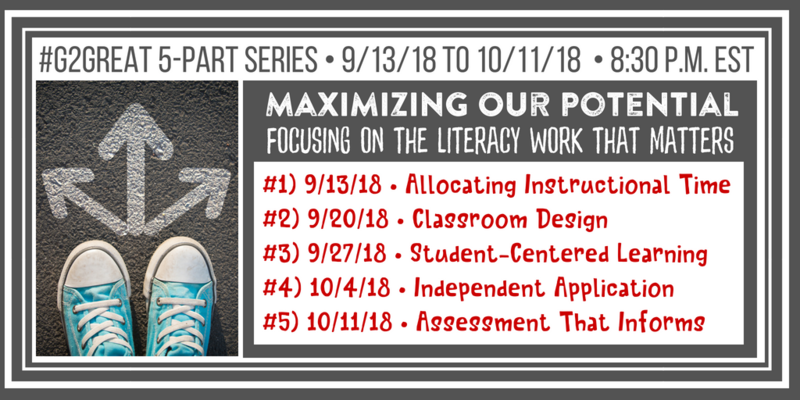 The curtain rose on our fourth chat in our “Maximizing Our Potential Focusing on the Literacy Work that Matters” with new friends from #LitBankStreet as well as other first time “chatters”, on October 4, 2018. It was quickly apparent that our topic was of great interest. And yet, as I reviewed the Wakelet I wondered about how the topic of “Independent Application” fit into the context of the entire series. As I began looking for patterns and themes in the tweets, it dawned on me that all of these topics have some dependence on each other. The way teachers and students “spend their time” depends upon what they value in terms of student-centered learning and independent work. 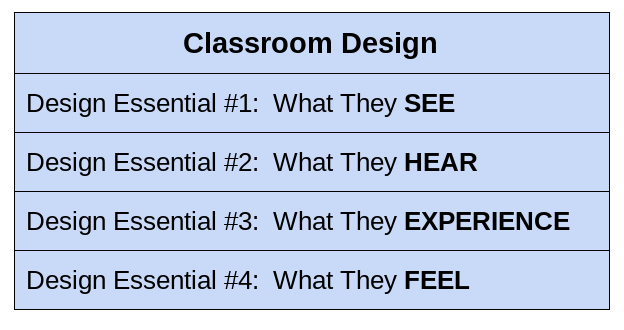 Classroom design is dependent on the amount of access students have to the resources within the classroom as well as the amount of time allocated for learning and the priorities for learning. Student-Centered Learning also shapes the classroom design and the flexibility of Independent Application. None really operate “in isolation” and that is both a blessing and a curse in education. The research “says” so many variables are influencers but has a hard time pin-pointing with laser-like precision whether it’s “this” or “that” factor because instruction, curriculum and assessment have variables as do the teacher and the many students bodies facing the teacher. So let’s begin with a bit of a review. Quality Independent Application has many definite attributes. Quality implies that it is “worthy.” Independent suggests that the goal is for the task to be done by the student without assistance. Application adds a layer of “work” to further instruction and practice. But what does that really look like? Many teachers have had much practice using a gradual release of responsibility model that appears to place Independent Work in the final phase of the instructional cycle as the “You do it alone” work. But it could just as easily be that check or reflection at the beginning of the class period on yesterday’s learning. 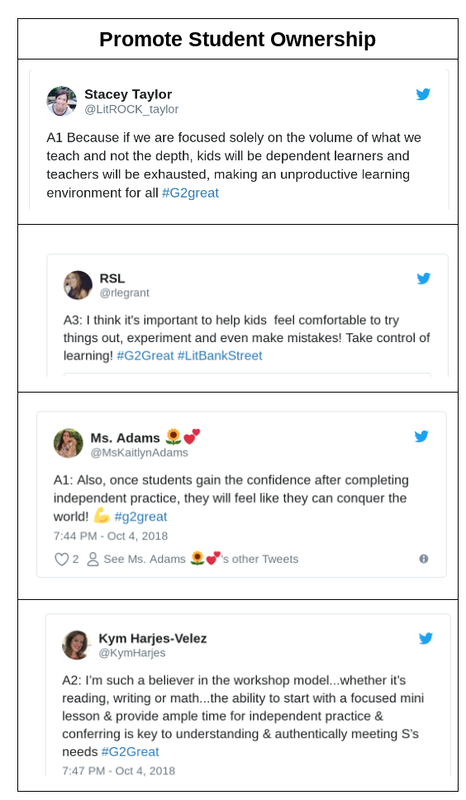 If we truly believe our goal as teachers is to provide a safe and nurturing classroom designed for optimal learning, filled with a community of self-directed learners we have to do less. The adults in the room have to establish the conditions that will increase agency and leadership in the students. Kym summed this up in this tweet: So how do we get there? What does Quality Independent Application look like? Quality Instructional Application does NOT produce cookie cutter pages to fill a bulletin board in stencil fashion. 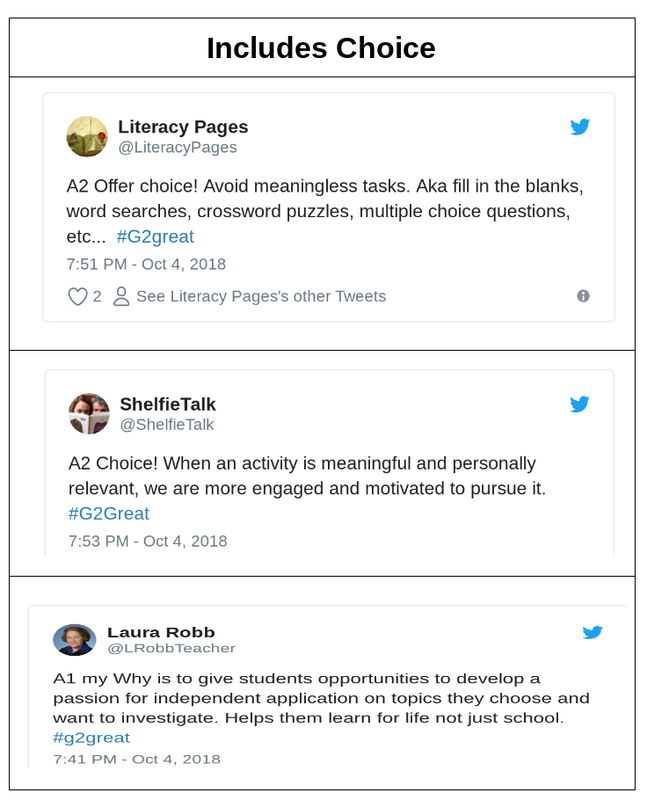 It involves real choices that allow students to showcase their learning in different ways. This is not homework as we used to know it because students have the opportunity to make decisions about their learning products. Students could choose their final product: a song, a poem, artwork, a TedTalk or even an essay to provide evidence of their learning. We hear about this type of learning from students who say, “let us show you the different ways we know this.” Student passion for a topic can then drive their learning so fewer incentives are needed. Quality Instructional Application is NOT a worksheet or busy work. Instead it includes authentic and meaningful tasks that students will find in the real world. Real work and real world. Not school work and the school world. Students are not asking “Why do we need to know this?” because that purpose has already been established within the classroom’s culture of learning. Quality Instructional Application is NOT about a grade in the grade book or points earned for a completed task. It may be a conference with a peer or the teacher about the learning process and the product. It may be using checklists or rubrics to check understanding as well as plan next steps. Feedback is also about comparing student work to mentor texts or student examples to deepen understanding about the task criteria. 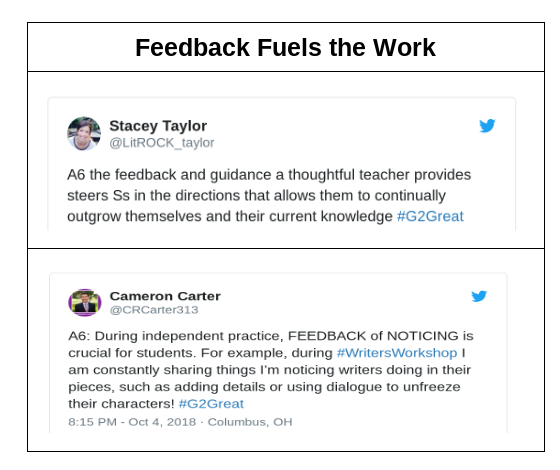 Feedback may be an excited utterance in the hall or a whispered reflection from the student that names the student learning. During the learning process approximations are valued and students know where they are because the learning targets are clear and concise. Self awareness, reflection and processing are valued as students continue to progress through learning cycles. Quality Instructional Application is NOT about a race for mastery of standards and learning objectives in lock step fashion. 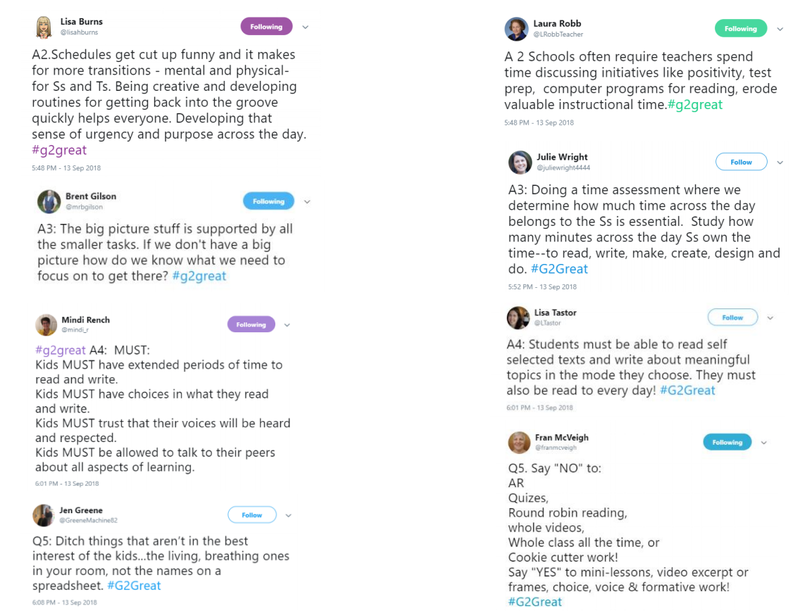 It is about providing the time and practice necessary for deep learning so that students can and do independently use the learning across the day, in additional content areas, and in unique situations in the real world. 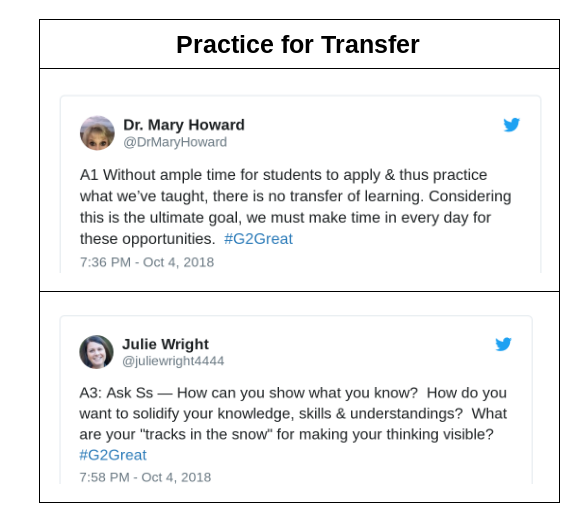 Time for the practice that is needed means allowing for differences in student learning with a focus on helping students discover the ways that they best learn. How many times does Joey need to do the work before it all makes sense? Quality Instructional Application is NOT sticker charts for every successful learning activity. It is about learning tasks that are hard work and include productive struggle. Students will embrace challenges and learn that real work does come before success. FAIL equals “First Attempt in Learning.” If the student always “gets the learning” on the first practice, maybe it’s not challenging enough or maybe the expectations are too low. Or maybe students need to be more involved in the design and delivery of the learning experiences (that pesky student-centered learning). The confident smile on the face as evidence of learning means more than a grade and provides additional reasons to set students free on their own learning paths. These five areas are characteristics that you might use when reflecting on Independent Application. Where do you see them? Where might you see more of them? Which ones are most important to you and your students? Furthermore, Wong and Wong (1998), found that 90 percent of allocated time was occupied by teacher talk. This is in opposition to the way that students learn best—by engaging in the authentic work of the content area. 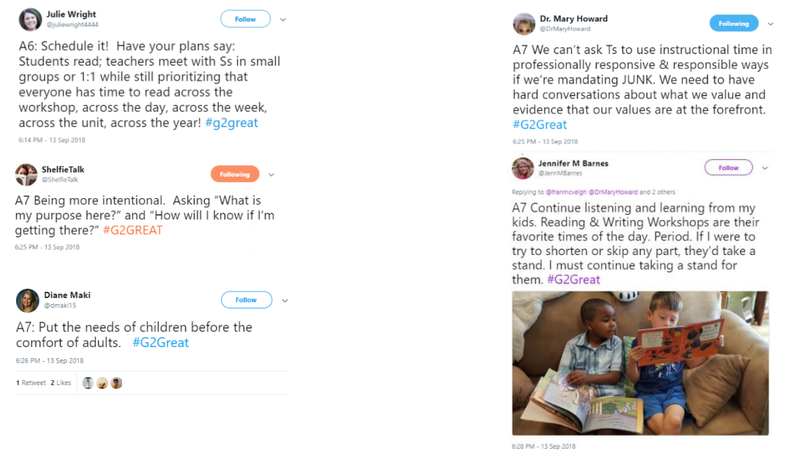 Teachers mean well in wanting to give students valuable information, but extended teacher “mini- lessons” which then result in brief student work time, (independent or group structures) doesn’t allow kids adequate time to internalize or sufficiently transfer the learning. 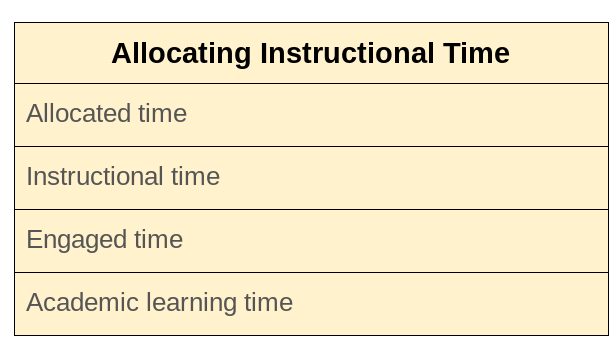 Other practices in classrooms also steal valuable minutes from academic learning time. One of the biggest time-wasting activities is using lesson time to collect resources, materials, supplies for the lesson. This unintentionally allows students to be in a sort of “limbo” and often results in off-task behaviors or undesirable social interactions. In addition, terse or non-existent closure for the lesson leaves students without a critical element of learning that “sticks”. Little or no intentional lesson closure also cheats the teacher of valuable formative assessment data when there is a lack of time for students to reflect, discuss or write about their learning. 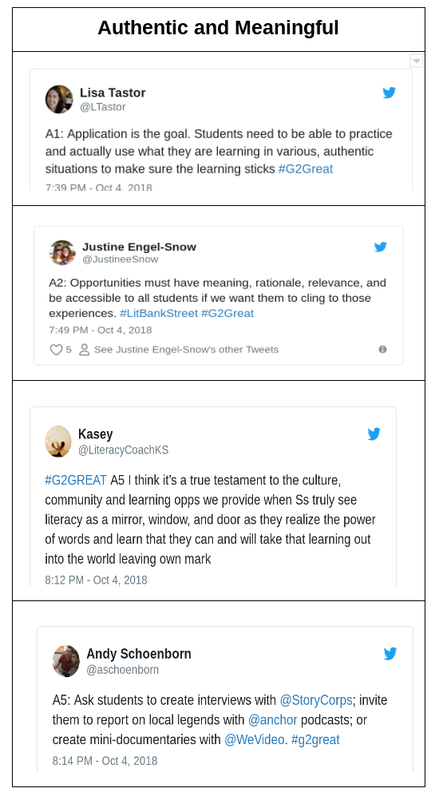 It’s true that academic learning is reliant on quantity of time, but it also involves quality of time spent on content standards and learner dispositions. 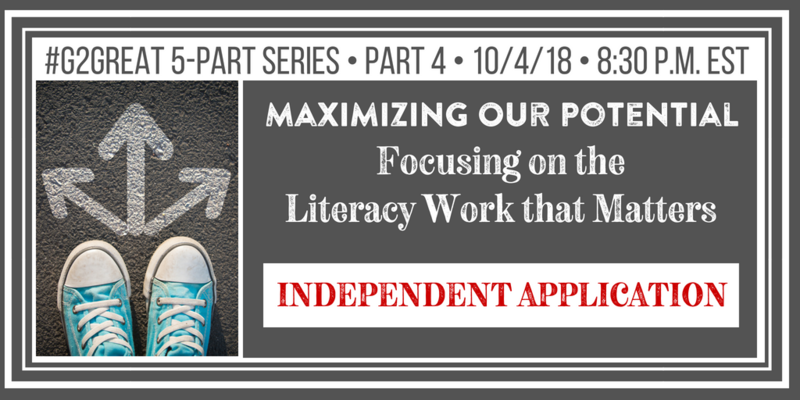 How much of the allotted time is dedicated to students working on the authentic tasks of readers and writers? Respectful tasks that lead readers and writers to greater understanding of the processes required for the work is critical for academic success. Instruction and practice of new concepts must be intentionally, strategically planned in a way that allows students to experience success at a minimum of 75% of the learning time. 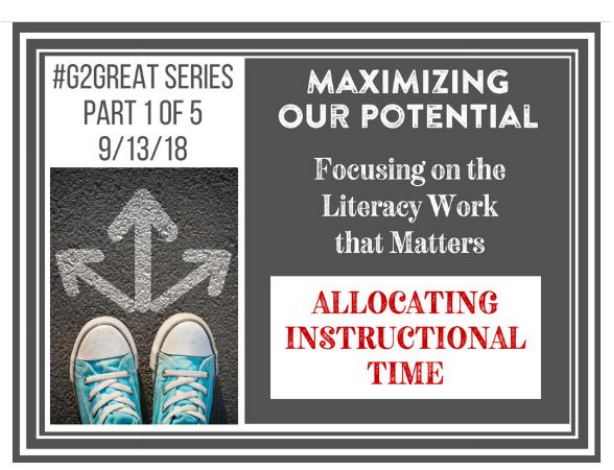 As professionals we know we are often plagued by the tyranny of the urgent, so we’re clear on the importance of intentional, systematic instructional planning that starts with the student at the core of the curriculum. 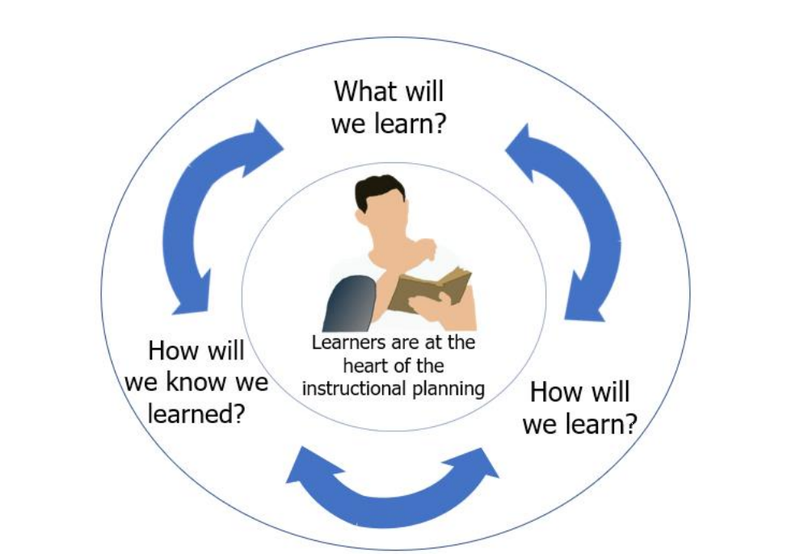 When we take the time to know our students, design instruction and application of new learning with adequate supports in place, use ongoing assessments that inform and influence subsequent learning we are aligning our practice with our belief that every student can and will learn.